To The Point Review 2019: Is To The Point a Good Hosting? To The Point is a web hosting provider based in Belgium. The vendor offers web hosting solutions and domain name registration services to small and medium-sized businesses in Belgium. To The Point is a website hosting company that targets individuals and small businesses in Belgium. The vendor only offers shared hosting services. 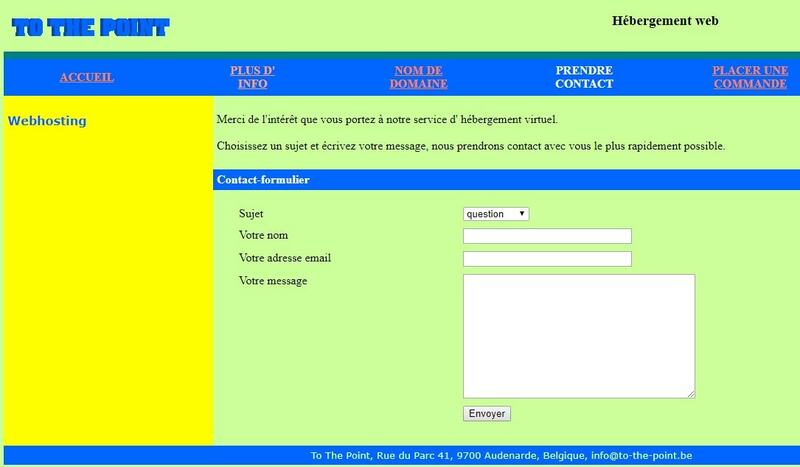 The To The Point website is only available in French. This shared hosting company provides three hosting packages. The entry level package comes with 200MB disk space and 3GB monthly bandwidth. The premium package includes 1GB disk space and 10GB monthly bandwidth. To The Point servers use the Red Hat Linux operating system. Given that Red Hat Linux OS was discontinued in 2004, it is hard to imagine that this vendor has continued to use it. This leads me to believe that this vendor may have been unoperational for over a decade. This vendor’s website is not very appealing. It looks like a spreadsheet and has very little information about its hosting solutions. Indeed, its design seems to not have been updated for many years. What’s more, it just lists the features included in its hosting packages without giving additional information to better explain the restrictions that users might find. The vendor offers no backup services to its customers. solutions it provides, especially the apparent disk space restrictions available in all of the hosting plans. All of the prices are listed in euros. The vendor has no money-back guarantee. To The Point claims to have an uptime of 99.5% but does not commit to any compensation plan in the event that its uptime falls below this promise. You can get in touch with the To The Point technical support team via its ticketing system or email. These are the only two means of communication the vendor has made available. It has no telephone support or live chat. With such limited means of contact, it’s not surprising that its support team isn’t available round the clock. What’s more, there is no knowledge base, meaning users have to rely on the support team to solve any hosting challenges they are likely to face; the very non-existent or at least unresponsive support team. As you can already guess, all of my attempts to get in touch with this hosting company were unsuccessful. I tried sending a message via the website contact form but the form was unresponsive. So, I used the vendor’s email address to send my questions. The vendor never replied to my email. To The Point hosting solutions are pretty basic and its features have notable restrictions. A close analysis of its hosting services shows that that its services would only adequately serve startups, small businesses, and medium-sized enterprises. However, there is a real possibility that this vendor has not been operational for years. Users considering its hosting solutions should proceed with caution. Wondering how To The Point stacks up against other Web Hosting companies? Enter any other Web Hosting company and we will give you a side-by-side comparison.